The Pepsi Billboard - A Tale of Ice Cold Revenge? On the banks of the East River in Long Island City a huge vintage neon Pepsi- Cola billboard, basks at night in a ruby-red glow, comforting like a fistful of Xanax. Urban legend says the sign originated in an epic battle of beauty vs. co-op board. Ravishing Hollywood beauty Joan Crawford had achieved the Everest of success, but she had her mind set on another lofty goal: to move into one of the most exclusive and luxurious apartment buildings in the world, the venerable Riverhouse in Manhattan. Build in the 1920’s in the affluent Midtown enclave of Beekman Place with apartments so grand some had more servants quarters than the average Manhattan apartment had bedrooms, the building was famous for its tranquil water views overlooking its very own yacht dock on the East River. The beautifully appointed art deco lobby with gilded Verre Eglomise mirrors opened to a lush garden, an army of staff catered discreetly to the wants and needs of industry titans. A fitting home for one of America’s most glamorous movie stars it would seem. Joan Crawford was one of the highest earning individuals in the 1930's and could have very well afford it. But the Riverhouse had long been notorious for its difficult co-op board and dared to reject many of the very rich and famous. 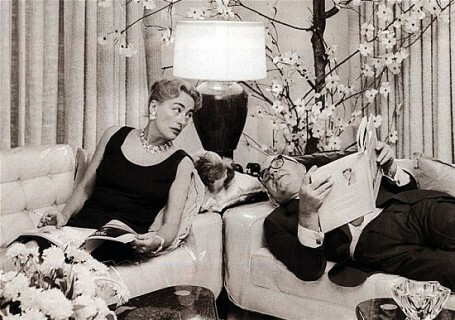 Rumors say Joan Crawford’s purchase offer was rejected because her husband Albert Steele was the CEO of Pepsi Co., chief rival to Coca-Cola, the company chaired by Robert Winship Woodruff, the president of the Riverhouse co-op board. Spurned Joan had the huge neon sign placed on the other side of the East River to ruin the priceless view of the Riverhouse residents. Could the story be true? Let's look at some facts. 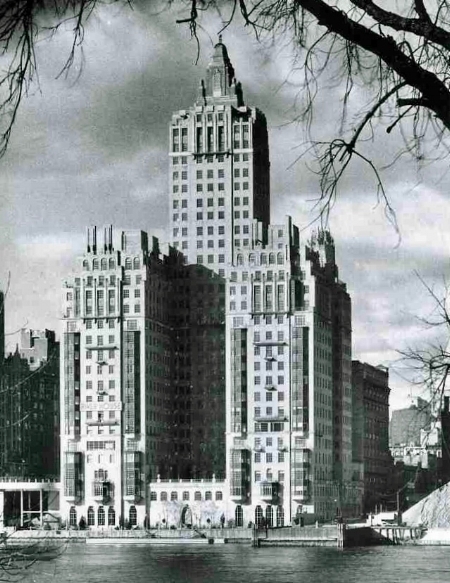 Crawford and Steele married in 1955 and bought a baronial 18 room Rosario Candela duplex at 2 E. 70th street, overlooking the Frick Collection on Fifth Avenue. A few short years later Crawford’s beloved husband passed away, and heartbroken Joan moved on to Imperial House on E. 69th street where she lived out her days as a leading benefactor and fundraiser for charities. The Pepsi sign had already been installed overlooking the East River in 1938. It was placed on the roof of the largest Pepsi bottling plant in the US in the industrial Hunters Point section of Long Island City. It became so iconic it was reconstructed after a winter storm damaged the corroding galvanized steel panels it in 1993. The bottling plant closed in 1999, and the land was sold to the Queens West Development Corporation, with a stipulation to reserve a space on the lot for the Pepsi sign. When the plant was demolished a few years later, the sign was temporarily relocated to nearby Gantry Plaza State Park. It is possible that Crawford had made a bid for an apartment in the Riverhouse before she married Steele in 1955, and used the opportunity to revenge herself later. After her husband died, she was elected to his seat as the first female director on the board of Pepsi Co., a position with considerable influence. The feisty 5'3" Texan had a reputation as a formidable foe just ask her lifelong frenemy, Bette Davis. The Pepsi billboard is now officially landmarked and protected. It lives in its new home in front of a newly constructed apartment building, still maintained by the Pepsi Corporation and dedicated to the people of Queens.